Trevor Clifton went Full Modern on Sunday. In the first inning, he strikes out the side. In the second, he starts Edwin Rios 0-2, but Rios battles back for a walk. He starts Kyle Garlick 0-2, but he battles back for a walk, as well. He then goes 3-0 to Jake Peter – and then about 6 of the next 8 pitches are foul balls – before Peter walks. Clifton then strikes out the next two batters. And he’s pulled. That’s it. 8 batters faced: 5 K’s, 3 walks. The Cubs have a rule in the minor leagues: you can’t exceed 30-35 pitches (depending on level) per inning. If you hit that mark, and the inning isn’t over, you come out. I think given this organization’s history of young pitching injuries, we can all agree on any “better safe than sorry” precautions. Wow. Just reviewed Michael Rucker’s outing yesterday (3 IP, 1 H, 0 BB, 4 K), it was one of the best I’ve seen anyone this spring. He impressed me a ton in ST, showing a change up that simply wasn’t a part of his game last year. Yesterday, he threw the pitch a ton, it was nasty. Rucker had a rough start to his season, so hopefully Sunday begins his turnaround. He’s throwing the change up a lot, getting a K to a right-handed hitter, getting called strikes at the low-outside corner to lefties, burying in the dirt when ahead in the count. For a guy who has had success being a good command, fringe fastball-breaking ball guy, this could be just what he needs. 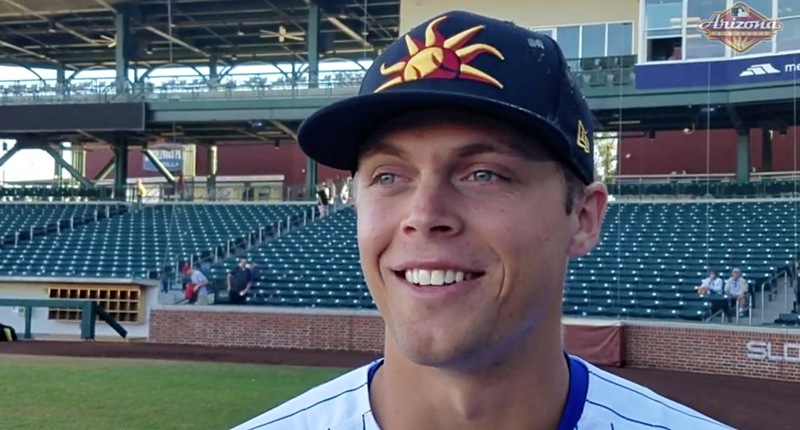 Don’t look now, but all of sudden Nicholas Mackie Hoerner is third in the Cubs system in wRC+ (by the way, bookmark that link, FanGraphs minor league leaderboards for the whole system are great). Hoerner nearly had his first home run last night, but instead it was merely a triple off the wall, his second triple in as many days. In total, then he’s 9-for-36, with 3 doubles, 2 triples, and more walks (7) than strikeouts (6). The most consistent hitters in the low minors, and I didn’t think I’d be typing that, have been South Bend corner outfielders Nelson Velazquez and Jonathan Sierra. Velazquez has reached in nine of the ten games he’s played, though I’d be remiss not to mention that his .481 BABIP is boosting his .333/.350/.410 slash line. Sierra now has a hit in all 11 games he’s played in this year, and if you go back to last year, in 19 of his last 21. He has just four strikeouts in 41 at-bats. And believe it or not, he even gave the SB Cubs their first home run of the season yesterday. For the radar gun fans: Brailyn Marquez hit 100 mph on the South Bend stadium gun in his start on Monday. It followed the first runs he allowed on a slurvy offspeed down the middle that went over the left-center fence. Luis Verdugo just homered to LF off rehabbing Tyler Anderson for #Cubs extended spring training team. 18-yr-old infielder from Mexico is noticeably stronger this year. One to watch when NWL season starts in June. And I’ll try to end all notes columns with a check on the standings for your four full-season teams: Iowa is leading the American Northern division with a 7-4 record. Tennessee is tied with Montgomery for the best record in the North division at 7-4 as well. Myrtle Beach, avert your eyes, is a Carolina League-worst 2-11. And South Bend is two games back in a pack of 6-6 teams. Previous PostPrevious post:Bryzzo is Struggling Equally, But in Different Ways – What’s the Story with Anthony Rizzo?